that my mother owns the property of the father we lost in October. what is a heirship certificate? A certificate issued by the Tehsildar who certifies that this and this person are the legal heir of the assest or money deposited in a bank account of an expired person. 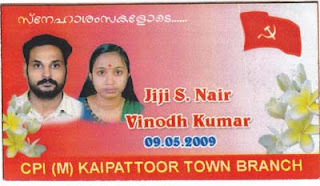 The local village officer should make a report saying his finding about us.Here a staff from the office helped in the format of the application.We got to write this and provide death certificate along with it.We carried id proofs of ourselves which was not needed.Again you got to provide couple of aged gentlemen who have been residing in the area and know our family for a long time.You got to give the identification proofs of these two gentlemen. Now the village officer will sign the report and you got to give it to the Tehsildar who forwards it to the government press in Thiruvananthapuram to publish an advertisement in the government gazatte which is a boring magazine published by the government on poor quality notice paper. Now the Tehsildar will give you a number regarding the ad.You got to go to thiruvananthapuram and meet the Government Press people and request them to publish the ad in the next government gazatte.If you do not request, it will take a long time to publish.Once it is published , the local taluk office recieves the gazatte but after a long time.So get a copy from the government press and present it at your taluk office. anyone has any objection, they got to object it before 30 days. quality paper and you got to get it signed by the Tehsildar and that is the damn certificate. if you pay the money the bank won't give back the gold.They got a f**king procedure.You got to provide them death certificate, complete some forms about 15 pages and a document certified by a notary. It was an old account of my father.Since it was old nomination was not done there.So you had to provide heirship certificate.Sign a letter the bank employee prints out on a 100 Rs non judicial stamp paper you provides him.Arrange a witness to sign some where in the form.Soon money gets transferred to your account.Even if you have 10 rupees you got to go through all such time wasting f**king procedures.The account was an old one renewed to work in tandem with a new DP account my father opened at a depository. I attended this not because they are my close relatives but i didn;t know how an aethist marriage looked like.It was simple two chairs placed in the stage and the groom ties knot.No customary things like background music (nagaswaram and melam in nair marriages).But i saw pudavakoda (groom giving bride a garment) in a modified form there.And we got a card greeting the couple from the local CPM office.I am putting that here.Sorry guys for putting it online.If you didn't like the pic ,just call or mail me for removing the pic. rich quick mantra of pyramid schemes and network marketing.Those guys spend hours trying to convince me and sign me up in there scheme.And at last they failed like three groups who tried in 2007 and 2008.